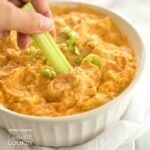 Buffalo Chicken Dip: a 5 ingredient appetizer for any occasion! 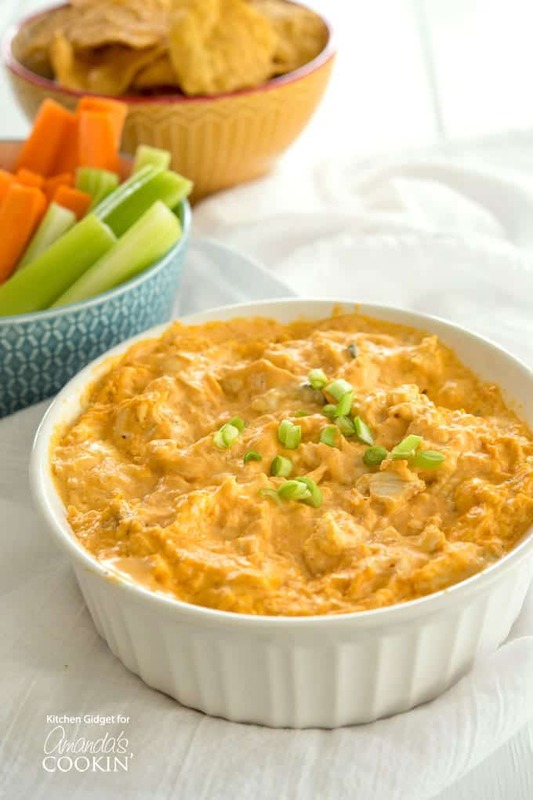 If you love buffalo wings, then this buffalo chicken dip is for you! Shredded chicken is mixed with cream cheese, hot sauce, ranch dressing, and topped off with cheese and served hot and melty. 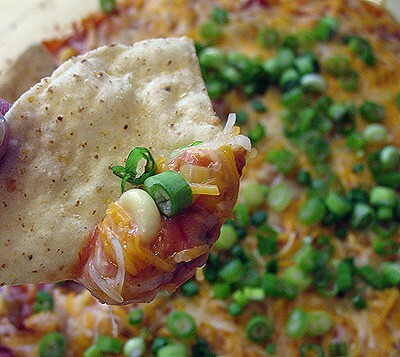 Only 5 ingredients and you’ve got a winning appetizer! I’m not a huge wings fan (unless we’re talking about the band! ), but this dip is another story. 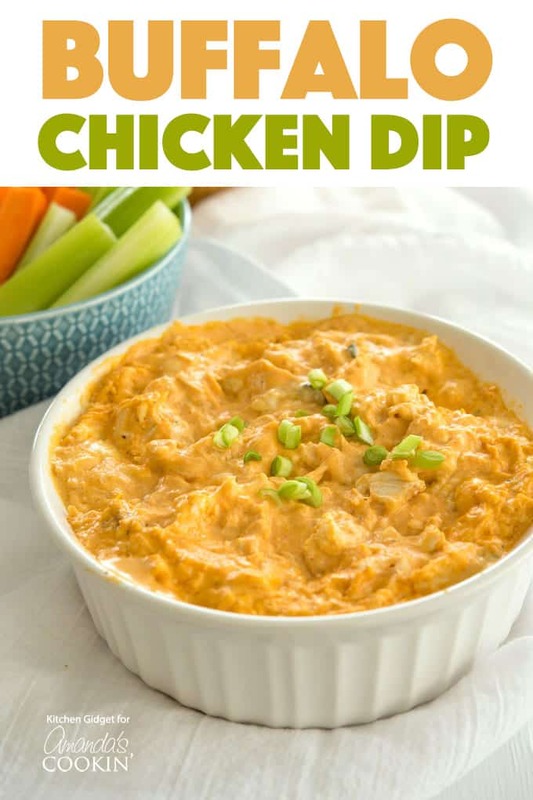 I can’t remember the first time I had buffalo chicken dip, but I do remember it was at a party. I couldn’t stop eating it and I wasn’t the only one! Quick and easy is one of the best things about dips, which makes them the perfect option when you need a party appetizer or dish to pass at a potluck. If I’m hosting, I like to make a variety of dips. 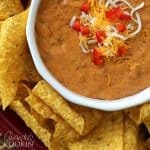 Something cool and creamy like queso fresco dip or this crockpot crack dip would pair nicely with this hot and spicy dip. For this recipe, you’ll need shredded, cooked chicken. Leftover rotisserie chicken works well, but I usually prefer to poach my own chicken breasts. That way I can cook extra and use it them for other meals throughout the week, like a quick fajita veggie quesadilla. While the chicken is still slightly warm shred with two forks or your fingers. Let your electric stand mix with the paddle attachment or hand mixer do the work. Place in food processor and lightly pulse. This will produce a more finely shredded texture. The chicken is then mixed with cream cheese, blue cheese, hot sauce and ranch dressing. You can also substitute blue cheese dressing for the ranch. 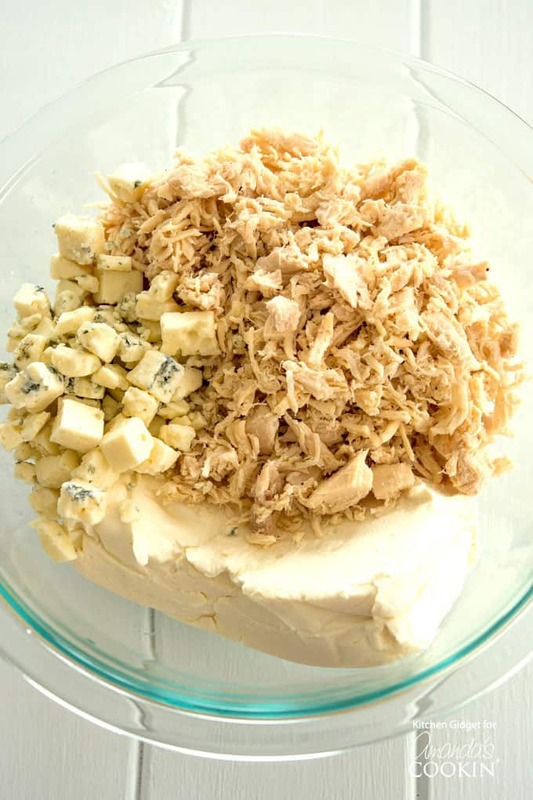 And if you’re not a fan of blue cheese, you can also use your favorite shredded cheese such as cheddar or Monterrey Jack. I find that this heat level of this dip is perfect for most people, it has just the right amount of spice. Start off with less and taste as you go if that’s a concern. To finish, this dip is baked until hot and is served warm. With the summer heat, I refuse to turn on the oven. Luckily, you can warm this in the microwave or even on the grill! One of the best ways to make this, however, is in the crockpot. Easy to transport if needed and keep dip warm. Crockpot instructions will be listed below in the recipe. I like to serve this dip with celery sticks since it’s the traditional buffalo wing accompaniment. You could also serve with carrots or any vegetable. Crackers, tortilla chips (my favorite) or sliced baguette also make great dippers. Check out more of our favorite warm dips below! 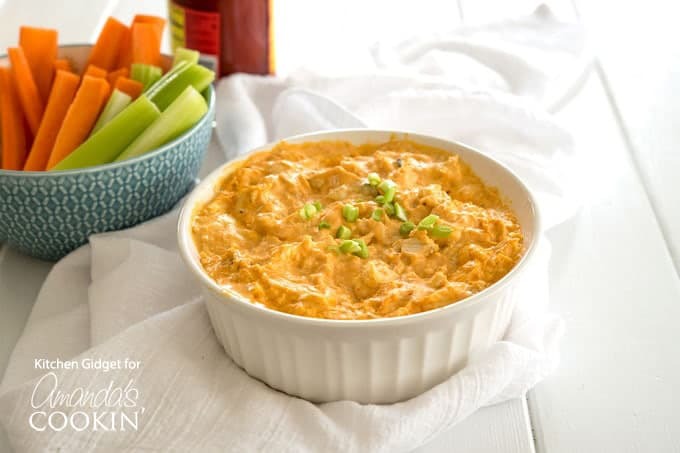 If you love buffalo wings, then this buffalo chicken dip is for you! Shredded chicken is mixed with cream cheese, hot sauce, ranch dressing, topped off with cheese and served hot and melty. Only 5 ingredients and you’ve got a winner! 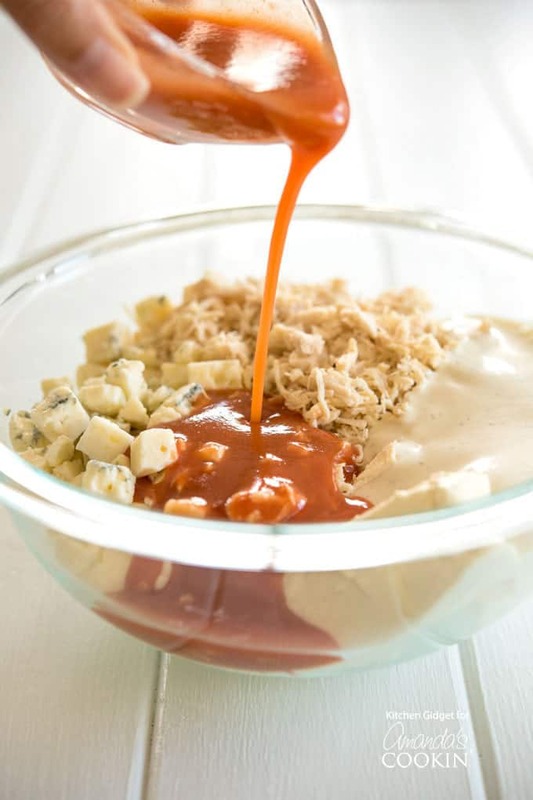 In a large bowl, combine chicken, cream cheese, blue cheese (or shredded cheddar), hot sauce and ranch dressing. Mix well and season to taste with black pepper. 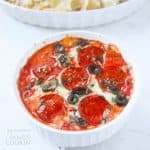 Transfer dip to 1-quart oven-safe dish and bake for 20 minutes or until dip is hot and bubbly. Serve with vegetables and chips for dipping. In a small slow cooker, combine the chicken, cream cheese, blue cheese (or shredded cheddar), hot sauce and ranch dressing. Mix well and season to taste with black pepper. Cover and cook on High for 1 1/2 hours or Low for 3 hours.